Networking is the process of building relationships and connecting with others to exchange information, advice, contacts, and support. It is an essential part of the job search process and a skill that will likely affect your success in the business world. Engineers rarely work in isolation so it is important that you develop strong networking skills to facilitate the collection of information, to identify skills for team projects and for a wide variety of other job functions. Good networking skills take practice to develop and the job search process is prime time for developing these skills. In the job search process, face-to-face networking is the most effective strategy and occurs at career fairs, information sessions, professional society meetings and other events where employers participate. In many cases, the employers attend specifically to network with you. Face-to-face networking is the most effective type because it provides the employer with the opportunity to assess your verbal communication skills, mannerisms, professionalism, and other characteristics that are difficult to evaluate without a meeting. Studies have shown that people tend to select things that are familiar to them and this generally holds true in the recruiting world. When presented with two equally-qualified candidates, an employer is more likely to offer an interview to a candidate with whom they have some familiarity. Networking through social media, such as LinkedIn, can also be used to connect with potential employers. 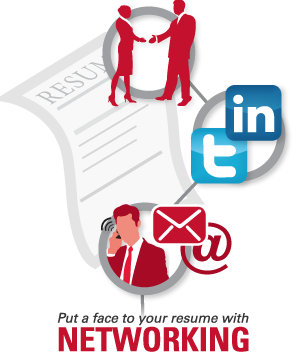 Some recruiters actively look for opportunities to connect with job seekers through professional social media platforms. They encourage prospective job candidates to connect with them through these channels. If you are very interested in working for a particular company, it can be beneficial to follow them on various social media platforms. This will help you receive up-to-date information on job openings and recent company news. “Liking” or commenting on companies’ posts shows interest and engagement in their organization. This type of networking also allows recruiters to gather information about your communication skills, interests, professionalism, etc. outside of the formal interview setting. Some job opportunities never officially get posted online. This is usually because the employer is contacted by a highly-qualified candidate or receives a referral before they get around to creating a position or advertising it. The process of seeking a position that is not currently posted is called prospecting. Networking can make a huge difference in your prospecting success. Networking for the purpose of prospecting usually starts by asking friends, family and acquaintances if they know anyone who works for one of your target companies or industries. Once you get a name and permission to contact the individual, you reach out to the individual and express your desire to work for the company or in their particular industry. Rather than asking the individual for a job, it is best to ask for help in connecting with someone else that may know of an opening. This takes the pressure off of them and if they happen to have an opening for someone with your qualifications, they will likely tell you. It may take numerous networking links before you actually connect with someone that is in a position to consider you for employment. Networks take time and effort to develop, so you must start early, remain patient, and be persistent without being overbearing. Start looking for opportunities to network with the employer long before you are actively looking for employment. Network as you gather information about employers and their industries at information sessions, career fairs, and other events. When working to connect with potential employers, network by attending events and becoming better known to anyone that may have connections. Expand your network by talking with faculty, staff and students that you may not work with every day. Follow groups and individuals on social media sites like LinkedIn and Twitter. Be genuinely kind, helpful, and thankful to everyone; in order for networking to work, people have to want to help you. Make sure to incorporate your job search into conversations. Don’t make this the sole focus of your conversation, but look for an opportunity to mention it. Be prepared to deliver your elevator speech, which will give the person a basic understanding of your qualifications and interests. Ask for help in connecting with someone that may know of an opening. An immediate connection is unlikely, so you need to get to the next person in the network. Remove any tension by saying something similar to, “you might not be hiring a person with my skills, but I was hoping that you might know someone who is.” If they happen to be hiring, they will let you know. Say “Thank You” and express your appreciation often. Always stay positive even when you are feeling frustrated.